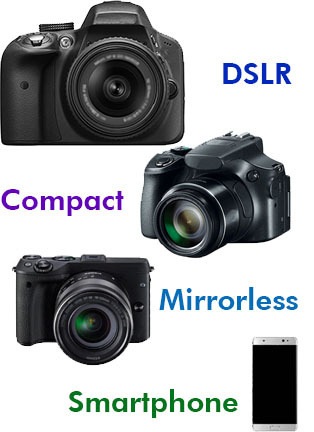 Smartphone, Compact, Mirrorless & DSLR? Excluding larger-format cameras (medium and large format), there are basically four types of cameras you're likely touse in your photography. Each camera type has it's advantages and disadvantages. Whether you use one or more of these cameras depends on what you want to get out of your photography and what you intend to do with your pictures. This eTip is about the advantages and disadvantages of each type of camera. This year, DSLR sales are down over 30% and 90% of all pictures posted online are from a camera phone. It’s clear where photography is going. Camera phones have gotten better, and many people find them good-enough for their needs. You won’t see professional photographers changing anytime soon to smartphone cameras. The quality required for publication and print is well beyond the capability of today’s smartphone cameras, even though their images may look good on the phone sccreen or a computer display. If you want your images to look better-than-average, than you will probably want to consider something other than a phone-camera. If you travel to a tourist location, you’re bound to see LOTS of selfie-sticks. You even see the comedic-looking tourist taking pictures with a 10-inch tablet. For these people, mobile-cameras are fine (although it’s questionable if a 10-inch tablet is "mobile"). 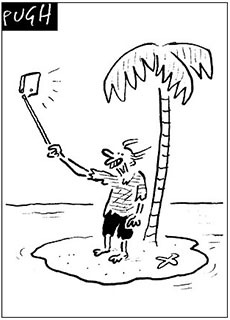 After all, selfies can only be taken (easily) with a smartphone. If you mainly shoot "selfies", then the smartphone is probably your most obvious choice of camera. But, if your photography interest goes beyond shooting "selfies", there are several options to consider. If you are in the market for a new camera, you have some decisions to make. The old adage of “the best camera is the one you have with you” applies here. If you don’t plan on making larger prints from your images, the quality is often more than adequate when viewed on a computer, tablet or smartphone. Cell phone cameras have a fixed focal length – this means they can’t zoom – yes, you can "appear" to zoom, but all it’s doing is magnifying the image, and when you do that, you create an image that has reduced sharpness and clarity. In addition, the focal length isn’t very good for portraits or wildlife, and it’s just OK for landscapes. You can get external lenses, but anyone whose tried that found out that they create pretty-poor images. They have VERY small sensors (up to 1/50th the size of some DSLR cameras), and sensor size determines the quality of the image. This causes more noise and low dynamic range (details in shadow and highlight areas). As good as manufacturers will claim, they still don’t take good pictures in low light. Even if you edit RAW images from a smartphone (available on newer Android phones), you aren’t gaining very much. Due to the small sensor size, there isn’t a lot more data in the RAW image, as there would be on a camera with a larger sensor. You don’t have "aperture" control on a smartphone – and as photographers know, the aperture is one of the most important aspect of photography. The aperture, combined with the focal length (both fixed on a smartphone) allow you to blur a background or keep everything sharp. Although some smartphone cameras have lots of manual controls, they’re often awkward to get to and set. The smartphone camera has its place, but the drawbacks are substantial. 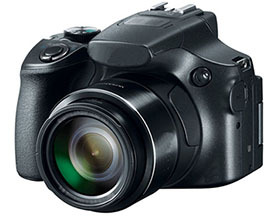 Compact point-and-shoot cameras are very popular in the US. These cameras are generally small and have a non-changeable lens. Often this lens as a very large zoom range. The most popular of these has been the Canon SX60 HS, SX50 IS, etc. These cameras put a lot of function in your hands at a reasonable price. But, there are serious downsides to these cameras. Function - they generally pack a long zoom lens into the camera allowing you to "zoom-in" to capture just a small portion of what the eye can see. Poor image quality - because compact cameras have very tiny sensors (not much bigger than a smartphone), image quality suffers. These images may be good for viewing on a computer, phone or tablet, but printing these images will yield poor quality. Lenses can't be changed, but, with a long zoom range, this may not be an issue. Long zoom ranges make taking pictures with these cameras almost impossible, as when "zoomed-in", even with stabilization, the small cameras are impossible to hold steady, yielding blurry pictures. If you're main interest lies in a relatively inexpensive camera with a zoom lens that lets you photograph the license plate of a car 2 blocks away, these cameras are fine. But, be prepared for relatively poor image quality. Long zoom lenses are also notorious for taking blurry pictures. In-between smartphone cameras and larger DSLR cameras are mirrorless cameras. They’re called that because DSLR cameras have a mirror and a prism (the bump on top of the camera) that allow you to view the image directly thru the lens using the viewfinder. Mirrorless cameras let you view the image on an LCD screen, and there is no "optical" viewfinder. You view the image on an LCD screen that’s either on the camera back or thru a pseudo-viewfinder. These cameras have much larger sensors than smartphone cameras, but most have smaller sensors than DSLR cameras, and sensor size generally defines image quality. Because there’s no mirror and prism, and because they generally have fairly small sensors, the cameras can be made much smaller than most DSLR cameras. This is an advantage that can be appealing. Mirrorless cameras have been wildly popular in Asia, but have yet to catch on in the US. They’re smaller and lighter than DSLR cameras and take much better pictures than a smartphone. Larger mirrorless cameras can have the same size sensor (APS-C) as consumer-sized DSLRs, thus image quality can match that of these DSLRs. Newer mirrorless cameras can take exceptional video. They can have very good high-speed shooting modes. Smaller cameras mean smaller batteries, thus usually shorter battery life. 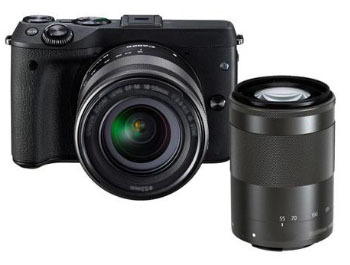 Mirrorless cameras don’t have the availability of accessories that DSLR camera have. Mirrorless lenses tend to be almost as big as DSLR lenses, thus holding the camera can be awkward. No mirrorless cameras (with the exception of a Sony "flop") have a full-frame sensor, thus they can’t approach the quality of a full-frame DSLR. Mirrorless cameras can be a good compromise betwen the heft of a DSLR and the poorer quality of a compact camera. They can make a good "travel" camera. The acronym "DSLR" stands for "Digital Single Lens Reflex". DSLR cameras have a single lens (some older cameras used to have 2 lenses - one for viewing and another to take the picture - they were called "Twin-Lens Cameras") and you view the image through a "reflex" viewfinder. The image enters the lens and is reflected up using a mirror into a prism (the prism causes the "bump" on top of the camera) so you can view the image thru the viewfinder. Being able to optically view the actual image the camera is taking thru the same lens that takes used to take the image can be a big advantage. It is much more accurate to focus and compose than an LCD screen of a mirrorless camera. If you want great image quality with the option of a great selection of lenses and accessories, you have little option but to go with a DSLR camera. They’re bigger – and this is can be an advantage when using telephoto lenses. Plus, a lot of people prefer holding a larger camera. They have an optical viewfinder that is much better in low light than the LCD/viewfinder of mirrorless cameras. Optical viewfinders are also much clearer and accurate than viewing a magnified LCD screen. Very good high-speed shooting modes. Very good movie shooting modes. 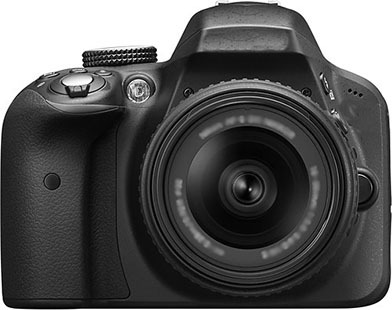 DSLRs basically only have one limitation: They’re bigger and heavier than mirrorless cameras. Smartphones are great for taking pictures anytime. They take excellent quality image when viewed on a computer/phone/tablet screen, but don’t print well. If you want one nice framed picture of your trip to (fill in your vacation spot), you will have to settle for a poor-quality enlargement from your smartphone. Compact cameras offer a lot of function at a reasonable price, but image quality suffers significantly for the convenience. Mirrorless cameras are a great compromise. With MUCH larger sensors than smartphones or most compact cameras, and good quality optics, they take much better image than smartphones. Larger mirrorless cameras (with APS-C sized sensors) can take images that can make decent-sized prints. Some people don’t like the feel of holding a small camera and viewing thru an LCD screen. Finding the right accessories can also be difficult. Finding a mirrorless camera you like can be a daunting task, however, with many manufacturers and models to choose from. DSLR cameras remain the mainstay of quality photography. The only downsize is size and weight, but this can be an advantage for some people.